The CNF is facing some significant challenges at the moment. 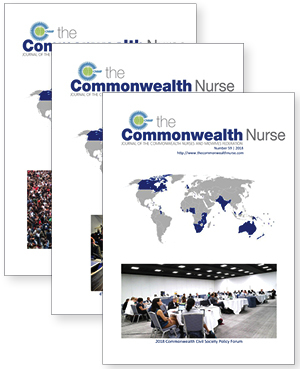 Many of you will be aware that the Commonwealth Secretariat, the administrative arm for the Commonwealth, proposed in their new strategic plan, that health and education would no longer be areas of work that the Commonwealth Secretariat would be involved in. In 2011, non-communicable diseases (NCDs) such as diabetes and hypertension were recognised at a UN high-level meeting ëas a threat to the achievement of internationally agreed upon goalsí (United Nations 2011). The statistics are startling. For example, as of 2011, there were 366 million people living with diabetes and this is expected to rise to 522 million by 2030 (Whiting et al 2011). The African Health Profession Regulatory Collaborative for Nurses and Midwives (ARC) is a four-year partnership between the Centers for Disease Control and Prevention (CDC); the Commonwealth Secretariat; the Lillian Carter Center for Global Health and Social Responsibility at Emory University; the East, Central and Southern Africa Health Community (ECSA-HC); and the Commonwealth Nurses and Midwives Federation (CNF). Nurses are in a potentially powerful position to be agents of change within their profession and within their country. Nurses are well educated; they are the largest group of workers within the health sector so have the advantage of numbers; they are generally well organised with a national nurses association; and they have a good relationship with the community.